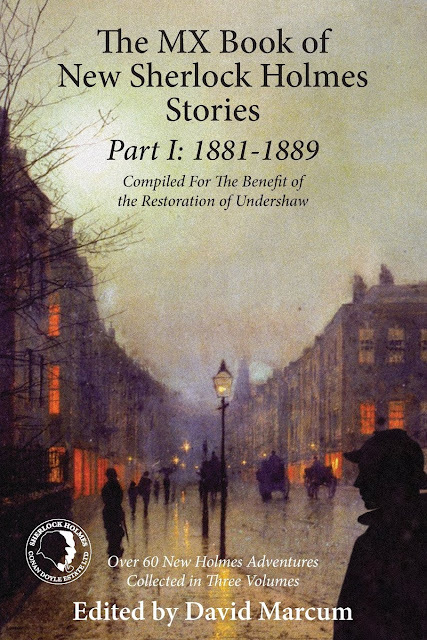 The first of a new three-volume collection of Sherlock Holmes stories published to help preserve Undershaw, the former home of Sir Arthur Conan Doyle. Part One of a record breaking three-volume collection, bringing together over sixty of the world's leading Sherlock Holmes authors. All the stories are traditional Sherlock Holmes pastiches. This volume covers the years from 1881 to 1889, including contributions from: John Hall, Hugh Ashton, Adrian Middleton, David Marcum, Jayantika Ganguly, Denis O. Smith, Amy Thomas, Kevin David Barratt, Luke Benjamen Kuhns, Summer Perkins, Deanna Baran, Shane Simmons, C.H. Dye, Mark Mower, Derrick Belanger , Daniel D. Victor, Steve Mountain, Stephen Wade, John Heywood, Will Thomas, Daniel McGachey, Martin Rosenstock, Craig Janacek, (and a poem from Michael Kurland). The authors are donating all the royalties from the collection to preservation projects at Sir Arthur Conan Doyle's former home, Undershaw.